I absolutely love bullet journaling! It is so much fun and such a great way to stay creative. You can try out different kinds of hand lettering, different weekly layouts, use all the colours you love, and generally do whatever you like because it's your own piece of art. I got a Leuchtturm1917 notebook for Christmas and I couldn't wait to start. I already had some experience because I also used a bullet journal last year, so I made a plan of all the things I wanted to include. For example a lot of different lists, pages for uni stuff and of course the monthly and weekly logs. But this time I am not talking about what pages I'm including in my bullet journal but about the tools I'm using to write and draw into it. To be honest my bullet journal kinda lacks colours but I am trying to use more colours to make it more beautiful. My favourite crayons are the Fantasia Colours from Aldi. They are very cheap, one box includes 36 crayons and the colours are vibrant. I prefer them over all brand-crayons I've used so far! Some other colourful pens I love to use are the Stabilo point 88 pens. I have a set of 20 colours and I mostly use them for my monthly habit tracker. But I also use them to beautify headlines or to highlight important things. The colours are also very vibrant but I've noticed that they easily fade if they are exposed to the sun/daylight. Boo! 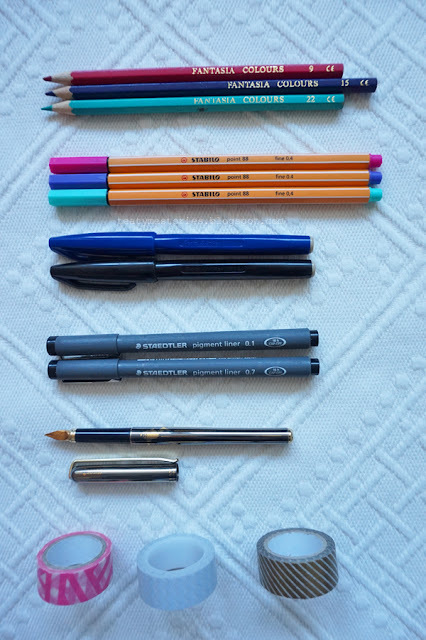 The next ones are Staedtler pigment liners in different sizes. I got them because they have a wide range of different sizes which is very useful if you want to draw very thin lines or if you want to colour some bigger parts. They are also not as expensive as other brands and I like their kind of black better than the Stabilo point 88 one, it doesn't bleed out as much, it's also darker and less blueish. My fountain pen is my favourite pen to use! It's so precise and the ink is beautiful. Unfortunately it's not waterproof so I can't draw over it with other pens. But I still use it for all the writing in my bullet journal. It doesn't bleed out and the black ink is really black. I love it so much! Last but not least I also love to use washi tape! My collection of washi tapes is not that big yet but it's growing. I'm still not very sure how to use it properly though, haha! In other people's bullet journal it always looks so pretty but in mine it looks kinda weird in my opinion... Well, I'm working on it I guess. I have washi tape in pink, gold, pale blue and pink and I have autumn themed washi tape. This is what I use in my bullet journal. I also use things as pencils to sketch out lettering, a ruler to draw straight lines, or a rubber to erase the pencil but I think these are kinda obvious and in the end you don't really see any of this in the "final" version. 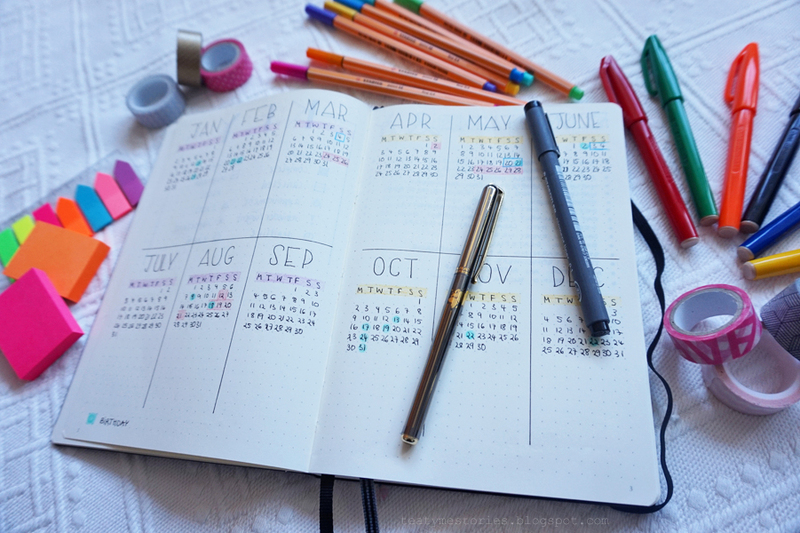 So, what are your bullet journal essentials? Can you recommend any other pens? I love bullet journals! I'm thinking of starting one - have you done any more posts about them? I love fountain pens too - they're SO nice to write with! And yes fountain pens are really great! I love this post! I tried making a Bullet Journal but it just wasn't working for me so I got a Blog Planner but these essisstenals would be perfect for that aswell! I soo need to get some washi tape, everyone has been raving about it, I need to add some to my stationery collection.